Ebola – oh my goodness. There is so much on the news and everywhere about it today. While it is a big deal, it doesn’t mean that you are in danger. I was asked to speak about this on GoodDay Columbus – you can watch the video by clicking on the video below. Many people get overwhelmed with anxiety and fear when they’re bombarded by all of the information and press out there. Here are a few tips to keep this in perspective and eliminate anxiety. Focus on the facts. There are specific ways to contract Ebola. It’s not going to just come into your home and life because we see it on TV. Find the actual facts if you are worried about it. Unplug! Turn off the news, turn off the computer and just stop listening to all of the information and bad news about it. Follow a healthy regime you would to avoid any illness. Personal hygiene, healthy eating, exercise. 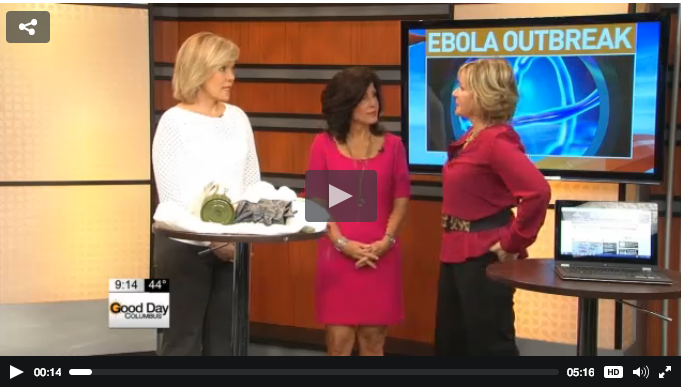 If you have a concern call the Ebola hotline by the Ohio Department of Health at 1-866-800-1404. The bottom line is you need to do what is healthy for you – mentally and physically. And you need to be calm and realistic for your children.